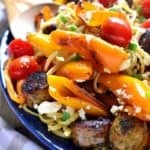 This Sausage & Pepper Linguine is chock full of vegetables and bursting with delicious flavor! Have it on the table in 30 minutes or less....this dish is perfect for busy nights and guaranteed to become a family favorite! While noodles are cooking, heat 2 Tbsp. olive oil in a large skillet over medium-high heat. Add halved peppers and sausage pieces and saute 10 minutes, stirring occasionally. Add grape tomatoes and walnuts and saute 2 more minutes. Remove from heat. In a separate container with a lid, combine 3/4 c. olive oil, lemon juice, garlic, oregano, salt & pepper. Shake vigorously to combine. Toss noodles with olive oil mixture; top with peppers & sausage. Crumble feta cheese on top and sprinkle with green onions.